Aluminum separator HEPA and ULPA grade cleanroom air filters with efficiencies up to 99.9999+% and pressure drops as low as 0.3" WG. Mini-pleat HEPA and ULPA cleanroom filters with efficiencies up to 99.99999+% and pressure drops as low as 0.12" WG. With HEPA Corporation's engineering capabilities our 5" deep separatorless filter pack translates into lower pressure drops, as much as 50% energy savings and extended life. For lower resistance, longer life and greater energy savings, our 7.5" deep mini-pleat offers efficiencies up to 99.99999+% and a pressure drop of 0.22" WG @ 100 FPM. For lowest resistance and longest life, our 10.75" mini-pleat provides the highest capacity performance with energy savings in a broad range of efficiencies. Gel or knife edge seal options for any filter as an alternative to gasketing. 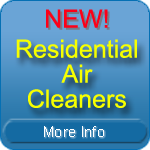 The newest solution to the soaring operating costs and increasing demand of clean air environments. Offers HEPA efficiencies at a fraction of the resistance of glass media. ASHRAE filters with efficiencies from 60% to 95%.